Empower your team to create complex report templates or to extract ad-hoc reports. No programming skills or deep system knowledge of the native applications are required. You can modify P&ID or Smart 3D data directly in the GUI of UniversalReporter. For more complex modifications you can use the “Import from Excel” function which helps you to update the P&ID or Smart 3D model with data residing in external files. Generate composite reports across multiple applications. Compare and validate all data in a single user interface. Mostly, several systems are used for a single engineering project. Therefore, it is difficult to generate composite and comprehensive reports. Sometimes it even makes it impossible to verify changes in engineering content between two specific dates. 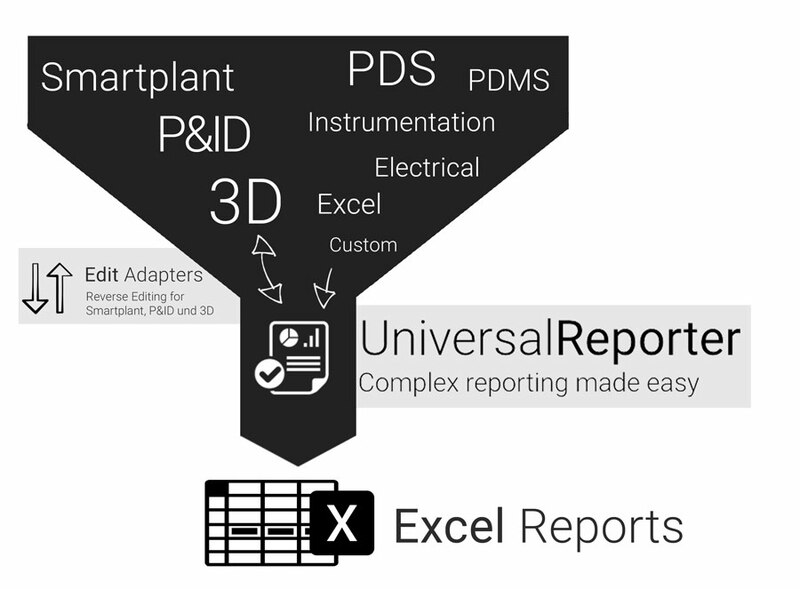 UniversalReporter is the quick and easy way to get the individual reports you need for your engineering projects. All you need are basic Excel skills. Even for complex requirements. Also when data checking and data consolidation is involved, UniversalReporter is the best choice to perform these tasks smoothly. It is always a challenge to create a piping MTO report where all components are listed and summarized (per area, unit and/or pipeline system) with the appropriate associations to each pipe run, area, unit, etc. It is always a challenge to create an instrument list with the appropriate connections to the equipment or pipe runs, because the information is stored in different areas of the database. Data is stored in different locations/departments each having the ownership of parts of the data. Data must be imported in a controlled process to the Smart 3D application. How can I quickly generate report templates? UniversalReporter uses Microsoft Excel to generate report templates. Initially the system generates an unformatted template file based on the content visible in UniversalReporter. Once this step is completed, all you have to do is to format the columns and rows using Excel in order to achieve the desired look and feel. Most engineering staff are familiar with these standard Excel functions. With this approach, you can even create complex report templates with multi-line data or data on multi-pages quickly and easily. Also, ad-hoc reports can be generated in minutes without requiring a report writing specialist. Created templates can be saved for re-use, making workflows more efficient. How can I compose reports from multiple applications? UniversalReporter can open data sources from multiple applications at the same time. This enables you to generate composite reports across applications and also to highlight object data on the P&ID and in the 3D model. This also allows you to validate the consistency of data that is held within the different systems (e.g. generate a Difference List Report between P&ID and 3D model data). How can I compare data between two specific dates? Find out what has changed. The snapshots created by the ReportAdapter can be opened simultaneously in UniversalReporter, and the difference list will mark the changes for objects which were added, deleted or modified. For P&ID data it is also possible to compare data based on the frozen revisions stored in the P&ID database (revision A versus revision B, or review X versus current content of the P&IDs). How can I modify P&ID attributes or Smart 3D data? It is often the case that data needs to be modified/consolidated for several applications. In the UniversalReporter grid, you can modify data coming from P&ID and Smart 3D and write the modifications back to the authoring applications. The write-back is executed via the original application’s API to ensure that all data is written back conforms to the application rules and the user’s application permissions. A generic “Import from Excel” function simplifies the process of changing multiple items in one step; e.g. pressure and temperature values can be imported based on a fluid code or 3D equipment descriptions can be imported based on an external equipment list or based on data from the P&ID, etc. How do I visualise the objects on the P&ID or in the 3D model? Sometimes you may want to review the graphical objects that are linked to the resultant queries and reports. E.g. you may want to see the equipment, pipe run or valve on the P&ID, or in the 3D model. UniversalReporter allows access to any related P&IDs (highlighting the object in SmartSketch) and it will also find the object in the UniversalPlantViewer (assuming the model file is available). How can I ensure the quality of my data? UniversalReporter was designed to make it easy to compare, contrast and highlight data inconsistencies. It has built-in functions for counting objects, e.g. find duplicate equipment names, valve tags etc.. It also allows the user to identify pipe runs having the same tag, but which are not connected graphically or for identifying pipe runs which do not have a line label placed (P&ID only). Another useful function allows the user to check if the attributes of the pipe runs connected to a pair of OPCs are identical. Additionally, there is a Detailed Data Quality Module that allows users to check the quality of the data for specific naming conventions or design rules. This can be transferred onto the report in order to enforce corporate and project data management quality standards. ReportAdapters connect to the source application database and extract data as a snapshot, which is then used by the UniversalReporter. EditAdapters allow the user to modify data and write it back to the source application via the source application’s API. UniversalReporter adds value to your organisation. Please contact us for either option at the CAXperts office.